Late in May, China implemented new standards aimed at preventing "state secrets being disclosed and uncertified maps published online." A major component to this push was a requirement that all online mapping services are operated with a license. The first 18 companies, of the ones that applied for a license, have been approved. Besides the local ones, several overseas companies have also applied. Though the list hasn’t been revealed, it looks like some of the big names are missing, including Google. AutoNavi was in the first list of the approved ones proclaimed on the website of State Bureau of Surveying and Mapping on February 8, followed by NavInfo on May 17 and Careland on June 13. Comment: If vehicle manufacturers want to launch Send2Car services, their actions have to be supervised by the Chinese government as the fourth category "map sending." Map-sending is a service model that’s used by user units to send or forward customized services such as search inquiry, route planning, and bus transfer to specific third parties. Map-sending can only be implemented by units that have got Class-A qualification certificate of surveying and mapping issued by the Chinese government. 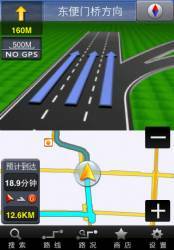 The Send2Car service launched by Google is a Telematics service of wide popularity, but the prospect of Google maps has been shadowed by its strained relationship with the Chinese government.